Take a detour from LA to tour the Grand Canyon, staying overnight at the Tropicana Las Vegas. 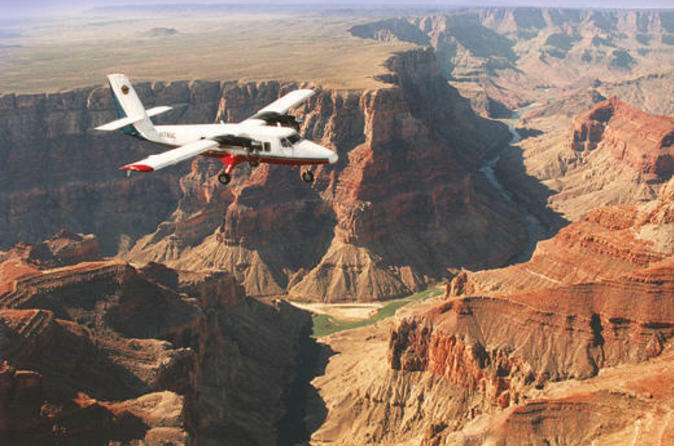 Flying between Las Vegas and the Grand Canyon, you'll take a West Rim air tour on this ideal overnight trip from Los Angeles. Traveling in style and comfort on a state-of-the-art motor coach, the 4.5-hour trip will fly by with a sophisticated entertainment system showing full-length new-release movies. After a short stop in Anaheim, you will be on your way! After a 20-minute stop in Barstow to stretch your legs, you will arrive into Las Vegas and be dropped off at Harrah's Hotel and Casino. From there you will transfer yourself to the Tropicana Las Vegas where you will spend the night. Enjoy free time to explore Las Vegas and unwind before your Grand Canyon Tour the following day. Capture the awesome natural beauty of the Grand Canyon West Rim with the best aerial views available aboard a deluxe scenic air tour. Keep your cameras ready as you fly over Lake Mead, Hoover Dam and the majestic Grand Canyon with guaranteed window seats for all! In just a few short hours (3.5 hours hotel to hotel approximately), witness the Grand Canyon firsthand. All the deluxe airplanes are air-conditioned for your comfort. The day concludes with your flight back to Las Vegas followed by bus transportation back to Los Angeles, arriving between approximately 8pm and 9pm. The price displayed is per person, based on 4 people per room. If you require separate rooms, you must make separate bookings.